A major feature of Gamestar Mechanic premium packs is access to advanced sprites, like Naviron avatars. These sprites can be difficult to understand and apply, but used well, they can unlock a wealth of possibilities, such as epic boss battles and intricate puzzles. 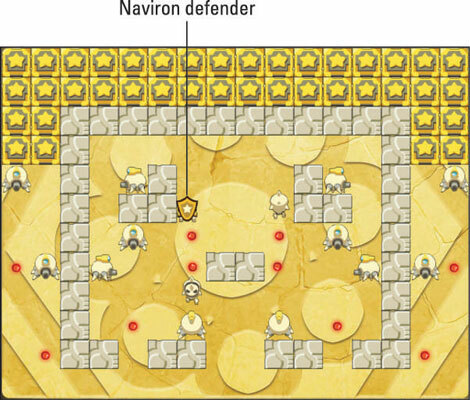 The special avatars known as Naviron defender and Naviron guardian are sprites with green clothes and yellow shields that can block attacks when you hold down the Action key. The defender is a top-down sprite that blocks in whichever direction it’s facing; the guardian is a platformer sprite that can block left or right. The shield, which is treated as a solid object, gives these avatars some interesting properties: The shield deflects enemies and absorbs bullets. The guardian can squash enemies by jumping on them while shielding. 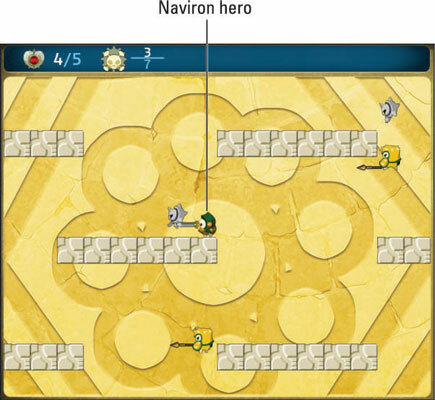 Similar to the Naviron defender and guardian, the Naviron knight and Naviron hero sprites have a shield (activated by pressing the Action key) and a sword (activated by pressing the Attack key). The sword can extend a short distance and, unlike bullets, can damage every enemy in its range. Hitting an enemy knocks it two squares backward. These sprites do lots of damage to groups of enemies, and they can hit twice with each strike if the enemy is against a wall and cannot be pushed. If you use one of these sprites, be sure to design the game around its powerful abilities. If one of these avatars picks up a blaster, it becomes quite powerful. However, you cannot hold down the Attack button to fire as you normally can, because the bullets are in sync with your sword strikes. The lancer’s spear, which is almost a sprite of its own, sticks out in whichever way the sprite is facing, effectively doubling its size. However, the lance is unimpeded by walls and doesn’t prevent the lancer from navigating tight places. The sentry’s shield is held close to its wielder. Only the sentry’s body does damage, whereas the lancer can hurt the avatar with both of its components. The lancer’s weapon pushes back the avatar with every hit. However, it can do only as much damage as it’s programmed to do, regardless of whether the avatar is pushed against the wall. Its range is as long as its lance, which is slightly shorter than the sword wielded by Naviron knights and Naviron heroes. The sentry pushes the avatar as it walks, dealing no damage but possibly destroying the avatar by pushing it into a wall or another shield. They can guard. These two enemies have a unique Movement Style option, labeled Guard, that lets them stay in place while watching a triangular area in front of them. If one of these enemies sees the avatar, an exclamation point (!) appears over its head, and it starts chasing you. Fortunately, you can dodge it or escape it, causing it to become confused and then return to its position. They’re stronger against shooters than sword users. Both the lance and the shield can absorb bullets, making them difficult to defeat with a blaster. You have to sneak up on them and attack from the side or back. Alternatively, shooting the lancer just above or below its weapon damages it. The Naviron knight, using a sword instead of a blaster, is quite effective against these enemies: Its sword is longer than the Lancer’s lance, so if you use it at the right time, you can damage and knock back a Lancer before it can do the same to you. 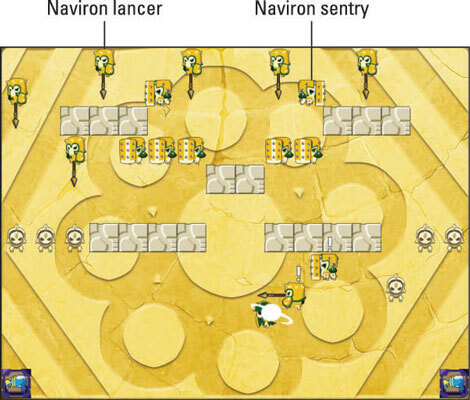 The sword can also push the Naviron sentry back with its attack, even if the sentry blocks. The knight’s shield is also effective: The lancer can push a shielding knight without dealing damage, giving the knight time to escape, and the shield causes sentries to change course.